﻿ October 2016: What’s New With Constant Contact? » Red Mango Marketing! 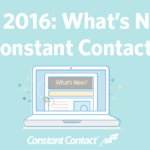 October 2016: What’s New With Constant Contact? Ready to learn about the latest and greatest features available in your Constant Contact account? Log in now to check it out. The post October 2016: What’s New With Constant Contact? appeared first on Constant Contact Blogs. This entry was posted on Saturday, October 1st, 2016 at 8:00 am	and is filed under Email Marketing, News & Updates, video. You can follow any responses to this entry through the RSS 2.0 feed. Both comments and pings are currently closed.